We know for a fact that the line separating menswear from womenswear has blurred significantly in the past few years with men donning skinny jeans and women perpetually rocking ripped boyfriend jeans. So when you say menswear, there’s no longer a sacredness or exclusivity to be expected. Trust women to find ways to wear menswear pieces, suits, shirts, boxers, what-have-you, and make them work! One such piece is the muscle tee. Thanks to the comeback of the grunge style that was so popular back in the ’90s, the muscle tee has wormed its way to present fads. I, for one, couldn’t complain. It is undeniably comfortable to wear. It’s versatile too! You can take the girly or the grungy route with it. Dominique’s printed muscle tee exuded biker-ish vibe. It seems right to wear it with something leather. And in this outfit, she wore it with a zipper-adorned leather pencil skirt. Styling tip: Like Dominique, pair your tee with a mini pencil skirt. Tuck it in and belt it at the waist for more body definition. It gives it a feminine flair. Her fashion blog, Dominique Nghiem, is no longer available online. Never be afraid to team up masculine and feminine pieces. They just work in creating and a balance that is easy on the eyes! Take Prisca’s outfit for instance. Her tulle skirt would have been too sweet and feminine but she tamed it a little bit with her fruit-printed muscle tee. Styling tip: Pair your tees up with below the knee skirts. The combination just gives off a more elegant panache. Her fashion blog, Mochaccinoland, is no longer available online. 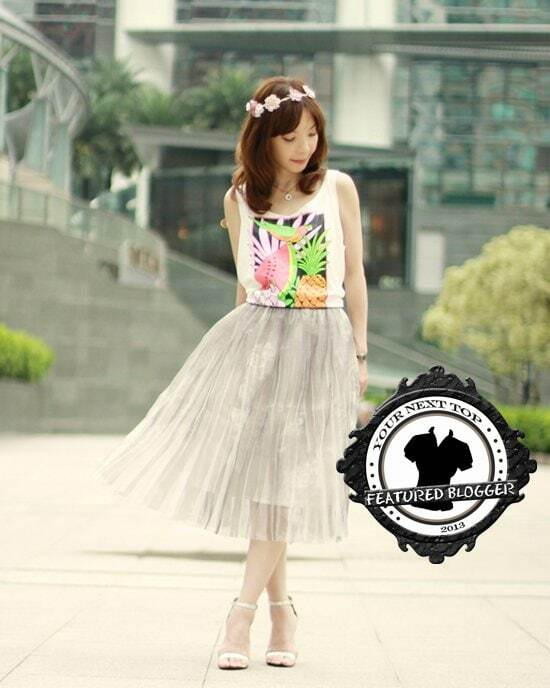 Ivelina from Frichic paired up this popular tee with the equally popular origami skort. You can’t go wrong with this pairing. It just screams street style through and through. Add up a pair of ankle-strapped sandals and a sleek shoulder bag for good measure. Styling tip: Follow Frickys’ lead and pull one side down your shoulder for that off-shoulder look. If you still have doubts about the versatility of muscle tees, this look will put an end to it. Larissa from From Hats to Heels was able to make the pairing of a sleeveless shirt and ripped jeans look elegant. That’s exactly how I will describe the overall ensemble. Styling tip: It’s all in the accessorizing. To make this extra glam, inject gold-tone pieces in your outfit. A chunky gold necklace, gold-accented belt or large gold earrings should keep the look extra glamorous. 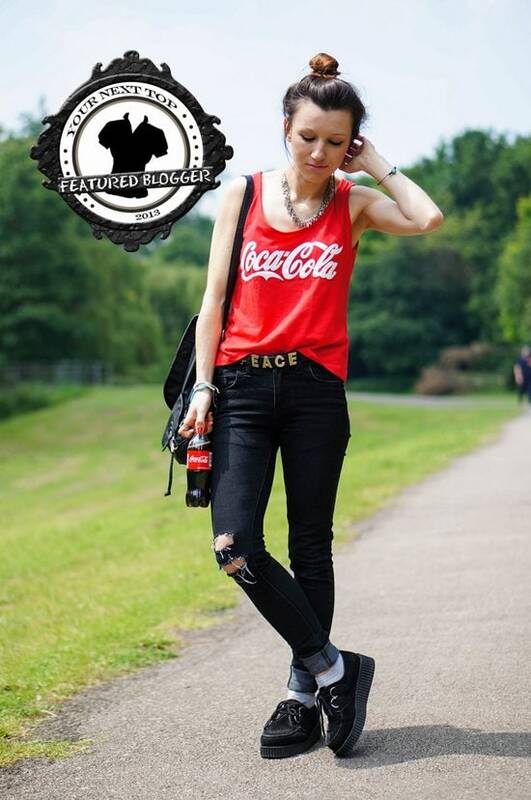 How adorable is Agata’s Coke tee? I’d wear it any day. Agata from Laughing in the Purple Rain seems comfortable wearing it with ripped skinny jeans and creepers. In the summer heat, this should be a perfect outfit to wear. Styling tip: Give it a relaxed vibe by tucking the front of your muscle tee to reveal your belt buckle but leave the rest of the hem hanging over your jeans. JL’s muscle tee with its creepy print might have caused a buzz in her workplace but we thought she rocked it to perfection. The asymmetric skirt is just the right touch to make this a head-turning combo. Styling tip: Punctuate this look with a pair of ankle-high booties. We found a cornucopia of adorable muscle tees at Nasty Gal. These are just so perfect for the summer, don’t you ladies agree?